← ATTEND BELLE ISLE MEETING ON GRAND PRIX FRI. JULY 13: NO PLACE FOR A CAR RACE! Searcy’s defense attorney Michael Dezsi smiles with Judge Timothy Kenny as AP Jason Williams leaves bench conference June 29, 2018; Kenny had just admitted transcript verifying ballistics evidence cited in defense brief. AP Thomas Chambers, in charge of hearing, retires just before final date—how deep does corruption in Prosecutor Kym Worthy’s office go? 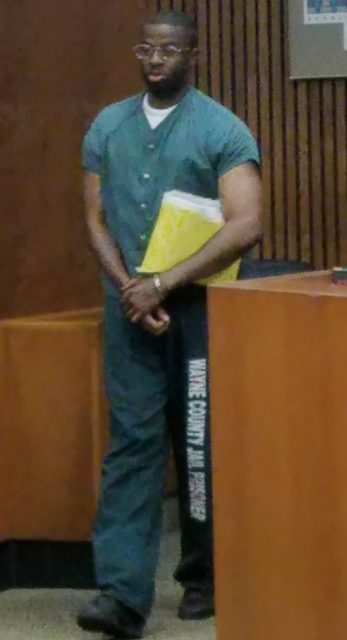 Thelonious “Shawn” Searcy enters court for final phase of evidentiary hearing June 29, 2018. DETROIT — “I would like to say for the record–NO, I’m not guilty of these charges that were brought against me. These charges are false. I didn’t kill Jamal Segars and I didn’t shoot Brian Minner. I thought justice would prevail. But still as a young Black man in the system I didn’t have a chance.” – Thelonious “Shawn” Searcy, of Detroit, statement May 23, 2005, prior to being sentenced to life without parole. 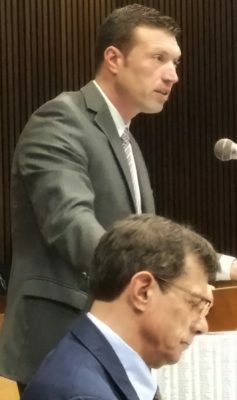 Defense attorney Michael Dezsi quoted his client as above during a stunning evidentiary hearing summation June 29, in front of Wayne County Circuit Presiding Criminal Court Judge Timothy Kenny. 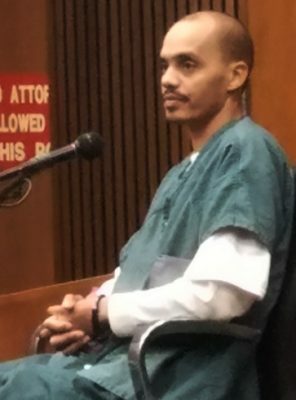 During his summation, Dezsi accused Detroit police, prosecutors and evidence technicians of falsification of evidence and other crimes that led to the conviction of his client for the murder of Jamal Segars Sept. 4, 2004, a murder to which Vincent Smothers later confessed. “I am one of 147 prisoners whose cases were found to have falsified forensics and ballistics evidence, leading to the shutdown of the Detroit crime lab in 2009,” Searcy told VOD later. He said the ballistics evidence in his case was reviewed by the Michigan State Police crime lab at the time, but that the MSP let it stand. As part of Searcy’s current evidentiary hearing, however, the MSP found a .40 caliber bullet which the Wayne County Medical Examiner said came from the body of the victim. It was mis-identified in original reports as a 9mm shell casing from the crime scene. 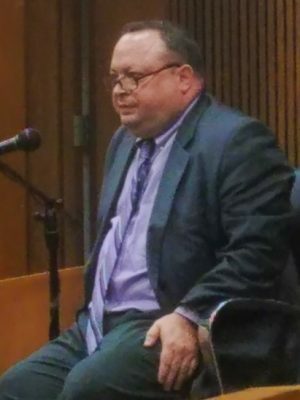 Scott Lewis testifies during Searcy hearing March 19, 2018. Private Investigator Scott Lewis, who interviewed Smothers, noted that no jury would have convicted Searcy knowing about the .40 caliber bullets, since prosecutor Patrick Muscat told them the murder weapon was a .45 caliber gun taken from Searcy’s grandmother’s house. 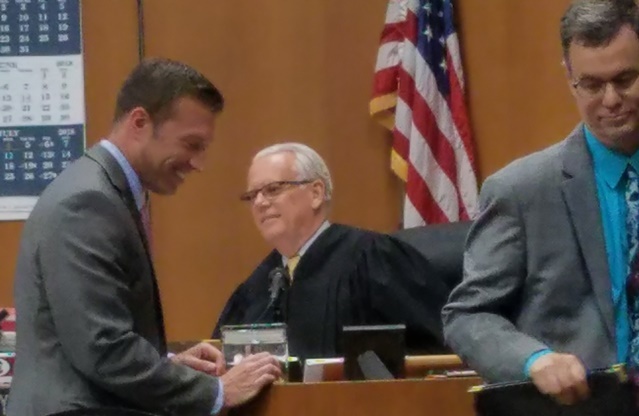 Assistant Prosecutor Jason Williams, head of Wayne County Prosecutor Kym Worthy’s appeals unit, took the place of AP Thomas Chambers June 29, because Chambers had abruptly retired. Chambers represented the prosecution during the evidentiary hearing, which began Jan. 29, and also wrote its brief. Williams’ chief argument, given during a painfully brief presentation, was that Smothers was not credible because he had retracted an earlier confession to the Segars murder. The June 29 hearing resulted from a 14-year battle for freedom begun by Searcy himself. Kenny finally granted Searcy’s pro se motion for the evidentiary hearing after Vincent Smothers confessed in writing and on tape to the Segars murder. Smothers himself testified from the stand during the hearing. 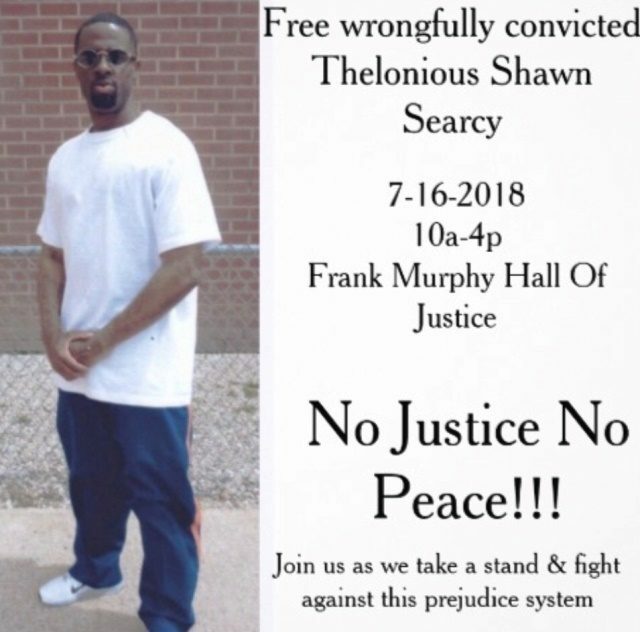 During each hearing, the courtroom has been packed with Searcy’s supporters, who have now called a rally at his request outside the Frank Murphy Hall Mon. July 16, at 10 a.m. (See flier at end of story.) Another rally on similar issues is being held by the Detroit People’s Task Force, which originally protested crime lab frame-ups, on Fri. July 20 from 9 am to 11 am, at the same location. 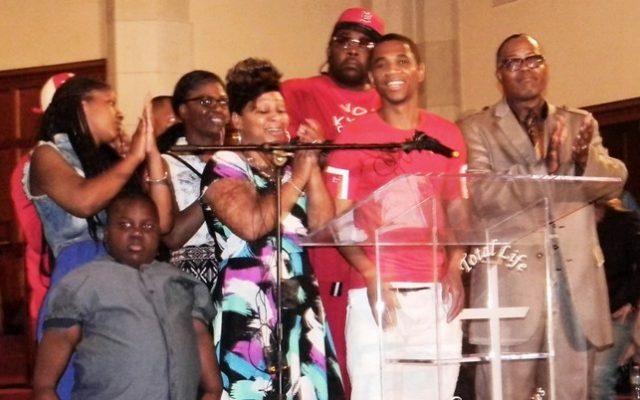 Davontae Sanford (center) beams as his family including (l to r) sisters, nephew, mother Taminko Sanford-Tilmon, stepfather the late Jeremaine TIlmon, and Apostle W. J. RIdeout III applaud his release. at press conference June 9, 2016. Smothers also confessed to four 2007 Runyon St. “drug-house” murders shortly after the false conviction and sentencing of Davontae Sanford, 14 at the time, for those killings. Smothers’ confession opened the door to Sanford’s release in 2016 and his compensation by the state for his wrongful conviction. 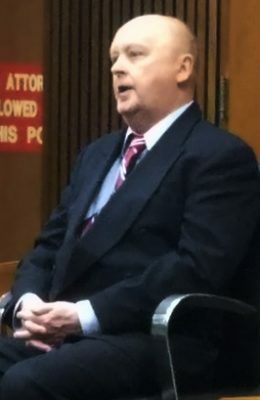 Assistant Prosecutor Thomas Muscat prosecuted both Sanford and Searcy at their original trials, and Detroit Police Sgt. Dale Collins played a major role in both cases. Vincent Smothers takes stand March 19, 2018 to give detailed confession to murder of Jamal Segars Sept. 4, 2004, exonerating Searcy. Dezsi pointed out that during Searcy’s trial, Assistant Prosecutor Patrick Muscat contended that Searcy killed Segars in a case of mistaken identity. Muscat said Searcy mistook Segars’ 2004 silver Corvette for a car driven by DeAnthony Witcher, Muscat’s key witness against Searcy who claimed the two had an ongoing dispute. Testimony at the trial was that Witcher drove a “twin” silver Corvette, later painted blue. But Searcy earlier had his grandmother file an FOIA request for his homicide file. In it, he found a police report describing Witcher’s arrest Nov. 14, 2004, for carrying a concealed weapon in a 1998 blue Corvette. Witcher was never charged. Instead DPD officers stormed Mrs. Richardson’s home the same day and arrested Searcy in front of his terrified grandmother, wife and two toddler daughters, for Segars’ murder. That arrest was based on testimony largely extorted from Witcher during a prosecutor’s witness subpoena interview, where the individual is not allowed legal representation. Dezsi continued, “Mr. Smothers provided us with a detailed map on which he marked the location of the murder, he marked the locations that he and his accomplice Jeffery Daniels had parked their cars, he marked the foot pattern of his actual whereabouts, how he walked to the car and how he shot Mr. Segars. Dezsi said only the actual murderer would have known those details. “Mr. Smothers also provided other details about the weapon,” Dezsi continued. Searcy earlier obtained from his homicide file a forensics report that used the same evidence tag number for both a .40 caliber bullet and for a .9mm bullet casing found at the scene of the crime, on Conner off Gratiot. During the hearing, DPD Sgt. Patricia Little, assigned to Prosecutor Kym Worthy’s “Conviction Integrity Unit,” produced the envelope containing the evidence in question and said the conflict was simply a “data entry” mistake. She said it originally had a red tag, used for evidence taken from a scene, which was replaced by a white tag, used for evidence from the medical examiner. Judge Kenny took possession of the evidence and ordered it re-examined by State Police as well as an independent forensics examiner for the defense. All parties determined the envelope contained a .40 caliber bullet taken by the medical examiner from Segars’ body during the autopsy. Dezsi said AP Patrick Muscat also presented what he claimed was the murder weapon at trial, saying it was tied to Searcy. “But it was a .45 caliber gun, it wasn’t a .40 caliber, and Sgt. [William] Anderson admitted that that gun could not have been the murder weapon,” Dezsi said, referring to Anderson’s testimony during the course of the evidentiary hearing. Dezsi noted that evidence technicians found both .45 caliber and .40 caliber casings at the scene. He said during the course of the evidentiary hearing, Chambers had asked witnesses about the casings found around the Corvette, and said they were .45 caliber. AP Patrick Muscat testifies at Searcy hearing May 9, 2018. “This is very important because the prosecution didn’t want to acknowledge that what was actually surrounding the Corvette were .40 caliber casings,” Dezsi said. “I have submitted to you Exhibit W, a police narrative report, which indicates the casings found on and around the Corvette were 40 caliber. This is important because the jury wanted to know since there were both 40 and 45 calibers at the scene, tell us what bullets killed Mr. Segars. And the jury was told we don’t know. It was false. That was simply false evidence that was presented to the jury. “How could this evidence have not changed the outcome of the trial if the jury would have heard that the bullet that came out of the victim was a .40 caliber and you now have a confession from an individual who says it was a 40–I used a 40?” Dezsi asked. He noted that Smothers knew other details about the crime scene, including the arrival of an unmarked police car that crashed with a burgundy Marauder, and the fact that the police car air bags deployed. He reminded the court that if there are any lingering doubts about the veracity of Smothers’ confession, it should review the 20-minute audiotape taken by private investigator Scott Lewis of that confession over the phone. Testimony presented by AP Chambers during the hearing included a State Trooper’s report that Smothers had recanted his first confession to the Segars murder, during the MSP investigation that led to the release of Davontae Sanford in 2015. The Michigan Innocence Clinic sent that confession to the MSP. Smothers said during the hearing that he recanted because he was told that his statement in the Segars case would impede the release of Sanford. He never said who told him that, but this reporter received an email from Michigan Innocence Clinic head David Moran stating the Clinic could not represent either Searcy or Charles Lewis. Lewis is a juvenile lifer who has been in prison for 42 years for a crime he has always said he did not commit. Moran said the Clinic’s representation of the two would constitute a “conflict of interest,” but never specified what it was. The prosecutor’s brief on the evidentiary hearing contained an allegation that Smothers could not have found Searcy’s case while he was looking for cases involving prosecutorial misconduct, because Searcy never raised the issue of prosecutorial misconduct in his court filings. Smothers told Searcy that was how he found his case, in his first letter confessing to the crime. That letter was given to Searcy by an intermediary. Dezsi’s summation, the hasty retirement of Assistant Prosecutor Chambers, and the fact that AP Muscat and DPD Sgt. Dale Collins prosecuted both Searcy and Sanford raises serious questions about the level of ongoing corruption that exists within Detroit’s criminal justice network, including the Detroit Police Department and the office of Wayne County Prosecutor Kym Worthy. Judge Kenny concluded the hearing June 29, saying he would review the prosecution and defense briefs, as well as trial and hearing transcripts, and produce his ruling later. The Register of Actions for Searcy indicates that he plans not to do that until Aug. 17, 2018. After the June 29 hearing, Atty. Michael Dezsi discussed importance of ballistics evidence in Thelonious Searcy’s case with Scott Lewis, the private investigator who interviewed Vincent Smothers by phone in prison and later obtained notarized affidavits detailing his confession to the murder of Jamal Segars. They agreed that if the trial jury had heard the evidence brought forward during the evidentiary hearing, Searcy would likely have been found not guilty. FLIER BY SEARCY FRIENDS AND SUPPORTERS. NOTE: Earlier edition of this story garnered 95 FB likes.